DISTRICT 8 WORKSHOP May 16, 2000 with Caltrans and Craig Dremann of the Reveg Edge. by Craig Dremann of the Reveg Edge. Photos by Jonelle Malloy, copyright © 2000. These are the local native plants we saw growing wild at the junction of I-215 and University Parkway, which have potential for use along roadsides for landscaping and mitigation sites. Lotus in California, each with a great potential for landscaping. The perennial native Croton californica, makes a beautiful gray border above the Lotus, and this area was also weed-free without any mowing or spraying. The tiny Sun cups (Camissonia sp.) add color. There are 64 different kinds of this beautiful, low-growing species in California. The showy Golden Aster (Heterotheca grandiflora) was beginning to bloom. 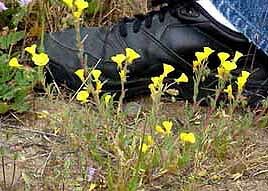 Plants flower from summer until frost, and they are able to colonize disturbed soil faster than the exotic weeds in the drier Coast Ranges of California. 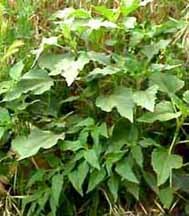 The wild native sunflower (Helianthus annuus), which is the wild ancestor to the cultivated sunflower, also blooms throughout the summer until frost, and is able to keep weeds out by releasing herbicide-like chemicals called "allelochemicals". 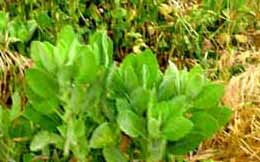 Plants grow principally at old Native American village sites in California. 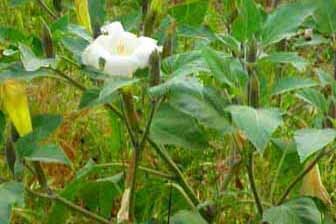 The showy perennial Datura wrightii, which also has the ability to keep weeds away, as the plants release natural herbicide-like chemicals. Our largest wildflower about 8 inches long and four inches across, white and light lavender, blooms all summer without water. 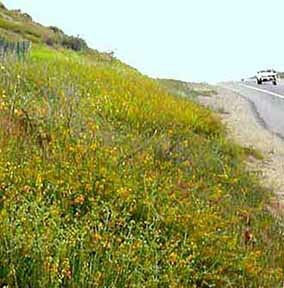 And finally, the two most forgotten and overlooked native plants along our California roadsides. 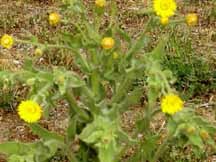 The photo on the left is of the Turkey Mullien (Eremocarpus setigerus), which could take the place of the exotic tumbleweed, especially along I-5 in San Joaquin county. 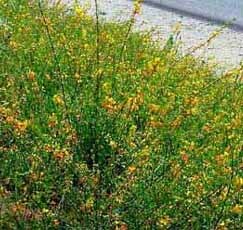 This plant thrives along the sprayed road edge, and a little management could make it an important low-growing, fire resistant edge-plant. 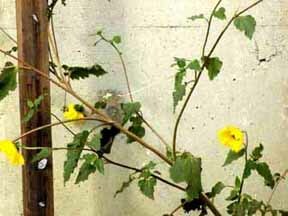 Plants are shown at their maximum height. HONORABLE MENTION: THE NATIVE PERENNIAL GRASSES that should have been present. The drawing on the right shows probably what originally grew in the junction of I-215 and University Parkway, one of the Stipas (Nassella cernua), one of California's "bunchgrasses" that are pictured on the State flag under the Grizzly Bear. 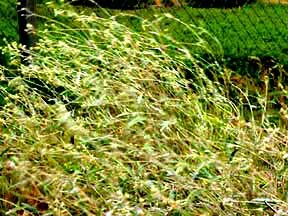 These grasses stay green at the base all summer without irrigation, and are usually under eight inches tall. Perennial native grasses would be a very important vegetation component to include in any future roadside management plans. Botanical names on this page is from the Jepson Manual edited by Hickman, University of California Press, 1995. The bunchgrass drawing is from Abrams' Illustrated Flora of the Pacific States, Stanford Univ. Press, four volumes.